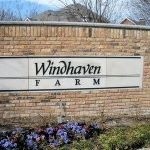 Windhaven is located minutes from the platinum corridor of west Plano. Located near 3 shopping malls, wonderful restaurants and minutes from the Dallas Cowboys training field! Schools include Brinker, Renner, Shepton and Plano West! Check out Legacy West!